This Atlas of Renal Lesions in Proteinuric Dogs describes and illustrates the tissue abnormalities that are observed in, and therefore characterize, kidney diseases in dogs with renal proteinuria. These lesions can be identified when appropriate tissue specimens are adequately examined by experienced veterinary pathologists. Preparation of this atlas is another outcome of the World Small Animal Veterinary Association Renal Pathology Initiative. The WSAVA Renal Pathology Initiative developed a standardized objective species-specific approach for the diagnosis of canine glomerular disease, and was published in 2016 (Cianciolo 2016). The published approach, which is also conveyed in this atlas, is based on routinely using standardized methods of tissue evaluation, including (1) examination of thin (3 µm) light microscopic (LM) sections viewed with a specific panel of histochemical stains, (2) immunofluorescence (IF) to detect the presence of immunoglobulins and complement components, and (3) transmission electron microscopy (TEM). These specialized evaluations have been performed at two veterinary diagnostic renal pathology centers, one in the United States and one in Europe, that were established for this purpose. These centers have now clearly demonstrated that canine renal biopsies can be evaluated with LM, IF, and TEM in a reasonable diagnostic workflow to provide timely and useful information to clinicians. Since their inception (in the US in 2005, and in Europe in 2008) these centers have evaluated more than 2,000 cases, the majority of which have been renal biopsies from proteinuric dogs in North America. The study that produced the published approach had 3 goals. The first was development of a digital pathology platform that permitted the study pathologists, who were in widely dispersed geographic locations, to communicate and collaborate effectively. Utilizing that platform, digitized LM slides and IF and TEM images were remotely accessed and evaluated by individuals and by the group during online meetings. The second goal was to develop succinct definitions and scoring criteria for glomerular, tubular, interstitial and vascular lesions observed in the specimens examined. The third and final goal was to use hierarchical cluster analysis to objectively identify common patterns of glomerular injury in dogs to create a simplified, reproducible, and accurate guide for veterinary pathologists to use when evaluating renal biopsies from proteinuric dogs. The results of that study are further promulgated by this atlas, which defines and illustrates the lesions that were identified and illustrates the spectrum of lesion severity exhibited by each of the common patterns of glomerular injury that occur in dogs. The glomerulus is composed of a network of capillaries supported by a central scaffolding of mesangium. Afferent and efferent arterioles that supply individual glomeruli are located at the vascular pole, which may not be present in every cross-section. Three cell types are present in glomeruli: mesangial cells, epithelial cells, and endothelial cells. Mesangial cells are located centrally within the tuft and there should be no more than 3 cells within the mesangium adjacent to a peripheral capillary loop. Endothelial cells line capillary lumens and have a thin rim of cytoplasm and oval nucleus. Glomerular epithelial cells are divided into parietal and visceral epithelium. Podocytes (also called visceral epithelial cells) are present on the abluminal surface of capillary loops and have specialized foot processes that are in contact with the glomerular basement membrane (GBM). The GBM is the matrix component of capillary loops that lies between the endothelial and epithelial layers. Parietal epithelial cells line the internal surface of the Bowman’s capsule, which encloses the glomerular tuft, and is squamous in appearance. Opposite of the vascular pole is the urinary pole where parietal epithelial cells transition from squamous to columnar epithelial cells of the proximal tubular epithelium. Cortical tubules are closely apposed with scant interstitium and peritubular capillaries. FIG 1. 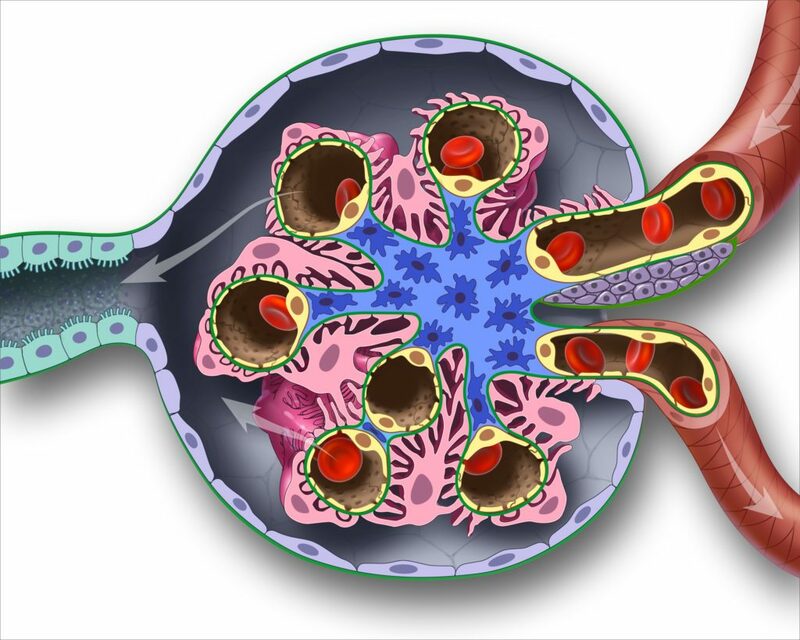 Schematic diagram of a normal glomerulus with colorized components. Podocytes are pink; Glomerular basement membrane is green; Endothelial cells are yellow; Mesangium is blue; Parietal epithelial cells are purple. Arterioles are brown structures at the right of the image. Proximal tubules are the teal stuctures to the left of the image. Contributed by Educational Resources, College of Veterinary Medicine, University of Georgia. INTEGRATION OF LIGHT MICROSCOPY, IMMUNOFLUORESCENCE, TRANSMISSION ELECTRON MICROSCOPY AND CLINICAL ASSESSMENT ARE IMPERATIVE FOR THE ADEQUATE EVALUATION OF RENAL BIOPSIES. Comprehensive histologic evaluation includes standard hematoxylin-and-eosin (HE) and special stains performed at ≤ 3 µm thick sections. 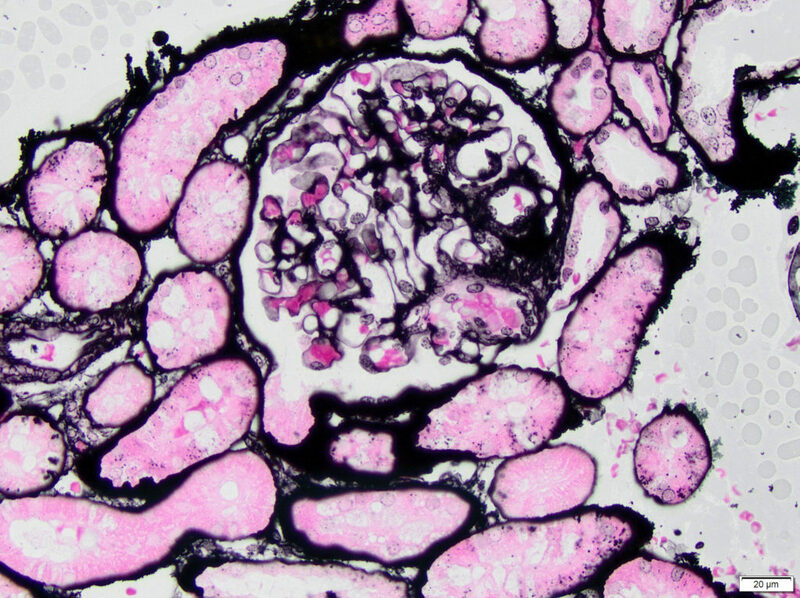 Congo Red stain is an exception and is performed on tissues sectioned 8-10 µm. Special stains include Periodic-Acid Schiff hematoxylin (PAS[H]), Masson’s trichrome (TRI), and Jones methenamine silver stain (JMS). All glomeruli should be examined in core biopsies and no less than 50 glomeruli with wedge specimens so that focal lesions are not missed. Glomerular features to be assessed by light microscopy include hypercellularity specifically the location, cell type, and severity; presence of synechiae, crescents, and hyalinosis. Furthermore, the remaining compartments (i.e. interstitium, tubules, vasculature) should be examined for lesions that may include but are not limited to fibrosis, inflammation, tubular atrophy, and arterio- and arteriolosclerosis. HE: A good survey stain, helpful for assessing inflammation, cellular and nuclear morphology. Glomerular basement membrane (GBM) may appear falsely thickened due to the lack of differentiation between matrix and cellular components. TRI: Basement membranes and extracellular collagenous matrix stain blue while cytoplasm is red. Glomerular immune deposits can appear as regular, small fuchsinophilic (red) nodules that typically reside on the abluminal surface of capillary loops. JMS: Excellent stain to evaluate for GBM remodeling (i.e. spikes, holes, double contours, and/or irregular outer contours). Normal GBM should have smooth outer contours. Tinctorial density of GBM depends on how the capillary loop is cut (perpendicular vs en face). FIG 2A. Hematoxylin-and-eosin (HE) of a normal glomerulus. Staining of cytoplasm and GBM are similar and difficult to differentiate, which might give the false appearance of thickened capillary loops. It is also useful in assessing inflammation (degree and cell type). FIG 2B. 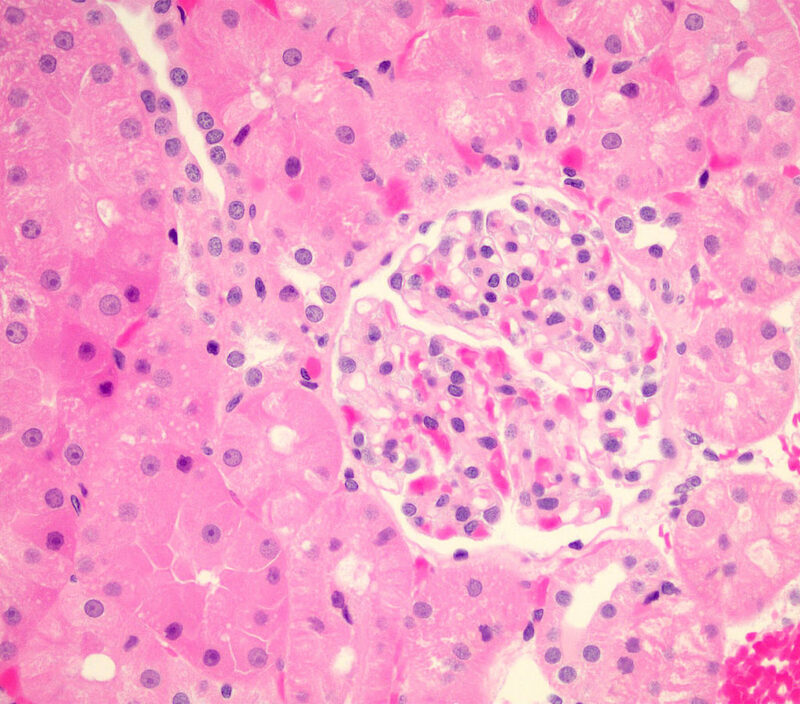 Periodic-Acid Schiff hematoxylin (PAS) of a normal glomerulus. Basement membranes are bright pink or magenta and of equal thickness. Nuclei are blue due to the hematoxylin counterstain. RBCs are pale peach while the cytoplasm of other cells (e.g. proximal tubular epithelial cell to the right of the glomerulus) are light pink. The apical brush borders of proximal epithelial cells are pink and easy to discern. FIG 2C. 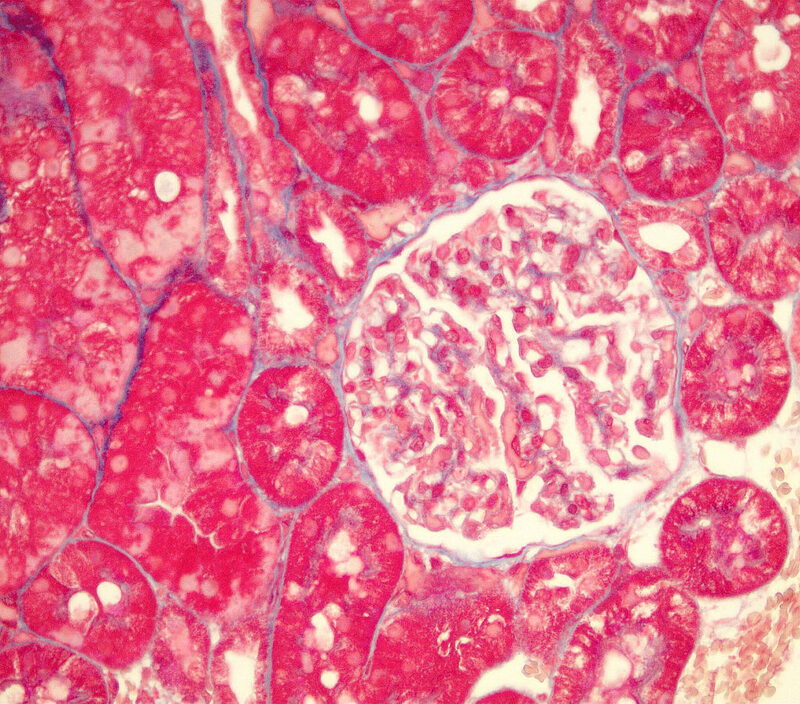 Masson’s trichrome (MT) of a normal glomerulus. Collagen (e.g.extracellular matrix and basement membranes) is blue with this stain. Cytoplasm stains red and RBCs are dark red. FIG 2D. 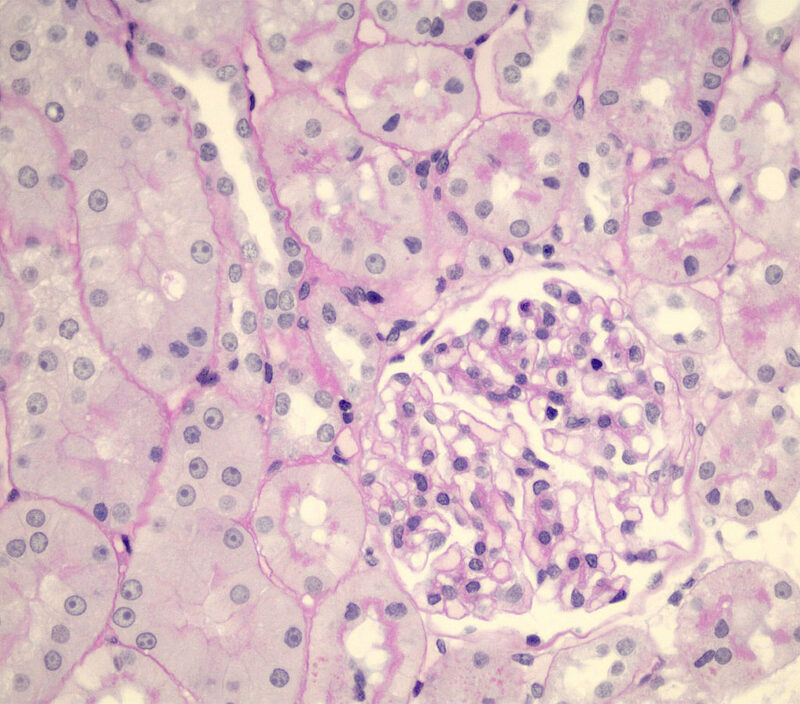 Jones methenamine silver (JMS) stain of a normal glomerulus. The capillary walls and mesangium are black, but the tinctorial density of GBM depends on how the capillary loop is cut (perpendicular vs en face). The outer contours of capillary loops are smooth and have an equal thickness compared to adjacent tubular basement membranes. RBCs within capillary lumens stain pink while other cell cytoplasm is pale pink with black nuclei. Because the immunofluorescence antibodies used target components of immunoglobulins (heavy chains and light chains), there should be minimal to no labeling of the healthy glomerulus. One of the immunoreactants, IgM, might label the glomerulus non-specifically. Normal tubules also often have various degrees of non-specific labeling. This method is used almost exclusively for evaluation of the glomerulus. Identification of the podocytes and their regularly-spaced foot processes that are oriented perpendicular to the glomerular capillary walls is usually a first step in orienting the pathologist as to the location of capillary lumens and the abluminal Bowman’s space. Nuclei within the urinary space are either podocyte or parietal epithelial cell nuclei. The glomerular capillary walls should have a smooth contour. In some preparations, the trilaminar nature of the glomerular basement membrane can be identified: lamina rara interna, lamina densa, lamina rara externa. Along the luminal aspect of the capillaries, there is a thin fenestrated endothelium with a single nucleus. Circulating red and white blood cells are occasionally observed. The mesangial matrix is usually more electron dense and has a fibrillar to granular appearance. The number of nuclei in the mesangium should be 1 to 2 per segment. FIG 3A. 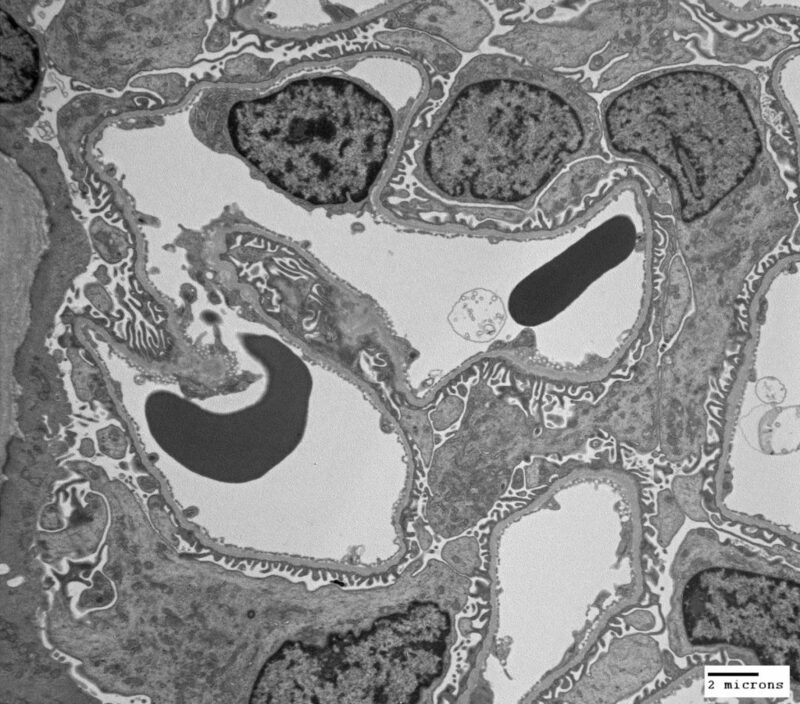 Ultrastructural transmission electron microscopy (TEM) image of a normal glomerulus. Several capillary loops are present. Endothelium lines the internal surface of the capillary walls. There is an endothelial nucleus present in the upper right capillary. On the external surface of each loop are numerous foot processes and a podocyte nucleus and cell body in the lower right between capillary loops. FIG 3B. Colorized version of above TEM. Endothelium is yellow, glomerular basement membrane is green, and podocytes are pink. FIG 3C. 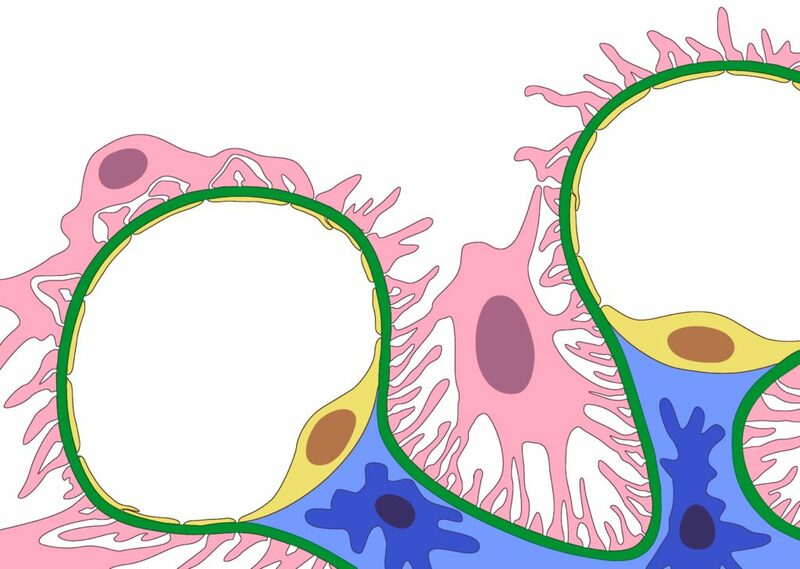 Diagram of 2 capillary loops from a normal glomerulus, with colorized components. Podocytes are pink; Glomerular basement membrane is green; Endothelial cells are yellow; Mesangium is blue. Contributed by Educational Resources, College of Veterinary Medicine, University of Georgia. FIG 3D. 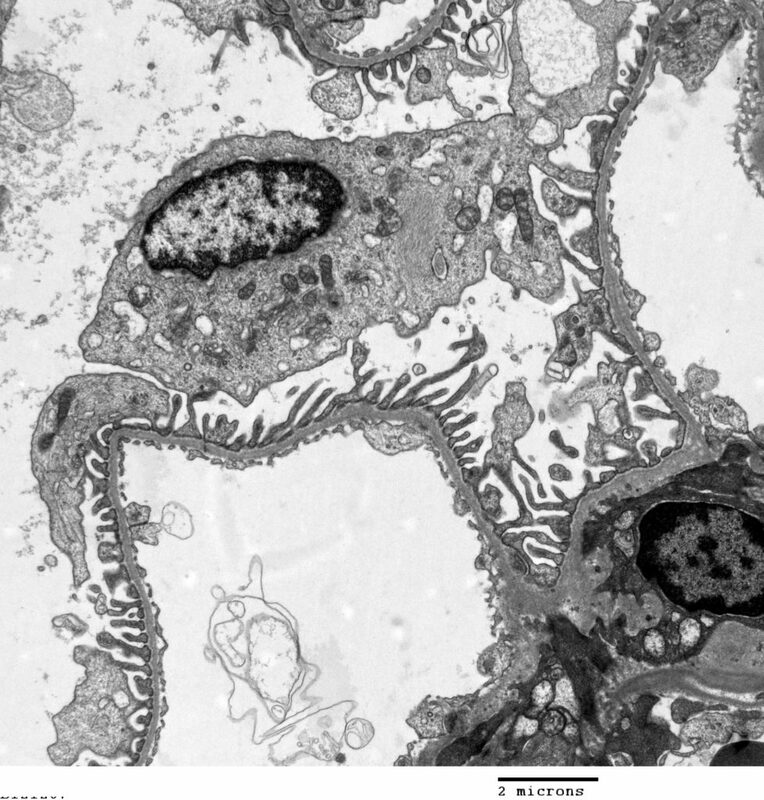 Ultrastructural transmission electron microscopy (TEM) image of a normal glomerulus. One entire capillary loop and one partial loop are available for examination. Endothelial fenestrations are easier to appreciate but an endothelial nucleus is not present in this section. On the abluminal surface of each loop are numerous foot processes that are perpendicular to the glomerular basement membrane. A podocyte nucleus and cell body is near the center of the transmission electron micrograph. FIG 3E. Colorized version of above TEM. Endothelium is yellow, glomerular basement membrane is green, and podocytes are pink.